Did Kentucky troll Louisville with $ band formation at rivalry game? 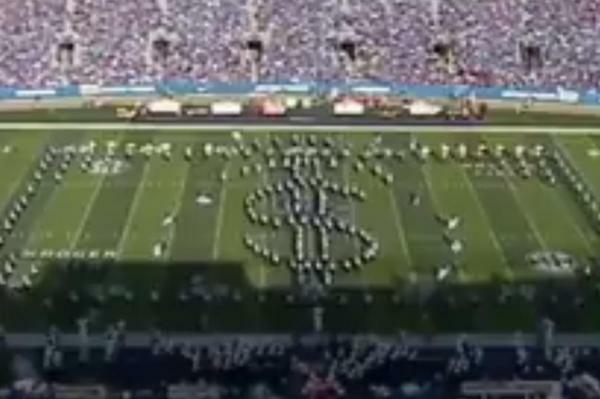 Nov. 25 (UPI) — The University of Kentucky’s band formed a giant dollar sign on the field Saturday, but the band director denies it was aimed at Louisville. Kentucky’s band pulled off the formation at halftime at Commonwealth Stadium in Lexington. The Cardinals won the game 44-17. Many fans in the Twitterverse were quick to relate the formation to Louisville’s scandal, which led to the firing of coach Rick Pitino and athletic director Tom Jurich. The school’s athletic board voted unanimously to fire Pitino in October after an FBI investigation into fraud and corruption rocked college basketball. Pitino has since filed a lawsuit against Adidas, seeking unspecified damages. The FBI allegations against Louisville included $ 100,000 in payments to the family of an unnamed player to sign with the school. The rivalry game was extremely chippy, including a fight involving Cardinals star quarterback Lamar Jackson. Kentucky faces Louisville on the basketball court at 1 p.m. Dec. 29 at Rupp Arena in Lexington.